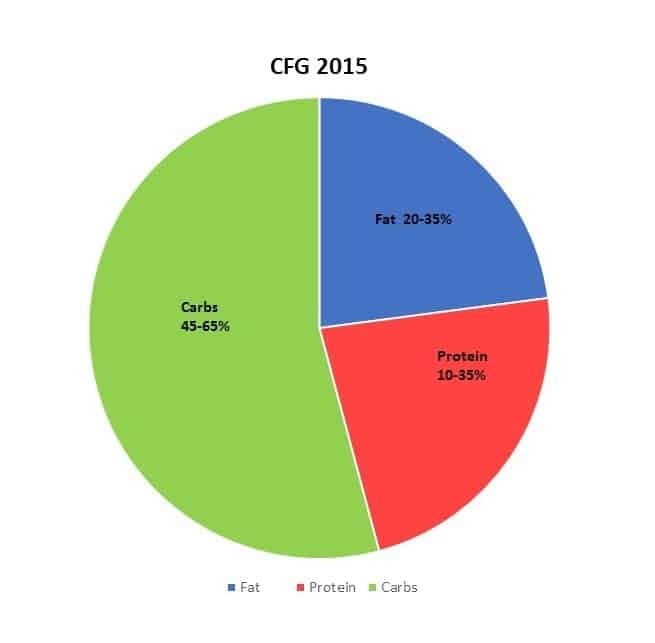 Since 1977, the dietary recommendations in Canada and the US has been for people to consume a diet with limited fat and where “complex carbohydrates” (starches) comprise the main source of calories. The US recommendations since 1977 have been similar to those in Canada, with the Dietary Goals for the United States recommending that carbohydrates are 55-60% of daily calories and that calories from fat be no more than 30% of daily calories (of which no more than 1/3 comes from saturated fat). Health Canada recommends limiting fat to only 20-35% of calories while eating 45-65% of daily calories as carbohydrates and currently advise adults to eat only 30-45 mL (2 – 3 Tbsp) of unsaturated fat per day (including that used in cooking, salad dressing and spreads such as margarine and mayonnaise). This is what people have come to call a “balanced diet“. For the past 40 years, the public has come to believe that ‘eating fat made you fat’ and that eating saturated fat caused heart disease. This however is not what evidence-based research shows. More on that in future articles. Our society has become “fat phobic”. People guzzle skim or 1% milk with little regard to the fact that just 1 cup (250 ml) has almost the same amount of carbs as a slice of bread. And who drinks only one cup of milk at a time? Most people’s “juice glasses” are 8 oz and the glasses they drink milk from are 16 oz, which is 2 cups. Who ever stops to think of their glass of milk as having the same amount of carbs as almost 2 slices of bread? In addition, carbs are hidden in the 7-10 servings of Vegetables and Fruit they are recommended to eat – with no distinction made between starchy- and non-starchy vegetables. Many people eat most of their vegetable servings as carbohydrate-laden starchy vegetables such as peas, corn, potatoes and sweet potatoes and then have a token serving of non-starchy vegetables (like salad greens, asparagus or broccoli) on the “side” at dinner. Who stops to think that just a 1/2 cup serving of peas or corn has as many carbs as a slice of bread – and often those vegetables are eaten with a cup of potatoes, adding the equivalent number of carbs as another 2 slices of bread? People drink fruit juice and “smoothies” with no regard for all of the extra carbs they are consuming (not to mention the effect that all of that fructose has). A “small juice glass” is 8 oz, so just a glass of orange juice has the equivalent number of carbs as another 2 slices of bread! Many grab a smoothie at lunch or for coffee break without even thinking that the average smoothie has the same number of carbs as 5 slices of bread! Then there is the toast, bagels and cereal or bars that people eat for breakfast, the sandwiches or wraps they eat for lunch and the pasta or rice they have for supper. These are carbs people know as carbs — which are added to all the carbs they consumed as vegetables, fruit and milk. What has been the outcome of people following these dietary recommendations to eat a high carb diet since 1977 ? In 1977, obesity rates* were 7.6% for men and 11.7% for women, with the combined rate of < 10 % for both genders. In 1970-72 the obesity rate in Canadian adults was 10% and by 2009-2011, it increased two and a half times, to 26%. In 1970-72, only 7.6% of men were obese but by 2013, 20.1% of men were categorized as obese. In 1970-72, only 11.7% of women were obese but by 2013, 17.4% of women were obese. In 1978 in Canada, only 15% of children and adolescents were overweight or obese, yet by 2007 that prevalence almost DOUBLED to 29% of children and adolescents being overweight or obese. By 2011 obesity prevalence alone (excluding overweight prevalence) for boys aged 5- to 17 years was 15.1% and for girls was 8.0%. The emphasis since 1977 on consuming diets high in carbohydrates and low in fat has taken its toll. Non-alcoholic liver disease is rampant and not surprisingly, considering 37% of adults and 13% of youth are abdominally (or truncally) obese – that is, they are carrying their excess body fat around and in the internal organs, including the liver. Since the 1970’s, Diabetes rates have almost doubled. In the 1970s, the rate of Type 2 Diabetes in women was 2.6% and in men was 3.4 %. In the 1980s that number rose in women to 3.8% and in men to 4.5%. In the 1990s the rate was almost double what it was in 1970; in women it was 4.7% and in men, 7.5%. If people eating a high carb, low fat diet has corresponded to an increase in obesity, overweight and Diabetes, then what’s the alternative? That is where a ketogenic diet comes in , which is a low carbohydrate, high fat diet which supplies adequate, but not excess protein. Eating this way enables us to use our own fat stores for energy, and to make our own glucose and ketones to fuel our cells and organs. Since humans are designed to run on carbs (in times of plenty) and in our fat stores (when food is less plentiful), ketosis is a normal physiological state. By eating a low carb high fat diet when we’re hungry and delaying eating for short periods, we can mimic the conditions that were common to our ancestors. By eating this way over an extended period of time, we can bring down insulin levels and as a result, decrease the insulin resistance of our cells. We can improve our blood sugar, lower our blood pressure and see our LDL cholesterol and triglycerides come down to normal, healthy levels. Why not send me a note using the Contact Us form located above?